Despite not really wanting to watch this film, I was sucked in by the nostalgia of my childhood love of TMNT. The toys, the cartoon series, and even the mediocre live-action movies. It was a pop cultural phenomenon, and I was in the middle of it, being the perfect age for the release of all of the things related to the Turtles. Hell, I even owned a tape of the movie soundtrack, when they were released in the four colours of each turtle (my copy was the purple Donatello version of the cassette). So, with hesitation and trepidation, I went ahead and cued up the reboot of Teenage Mutant Ninja Turtles on Netflix. Why not? How bad could it be? I’m sure it wouldn’t be able to retroactively ruin my childhood. Well, it can be pretty damn bad. the acting is absolutely terrible. Megan Fox brings us to new levels of bad in this role. But even she is surpassed by William Fichtner in this movie. It is not good at all. Not that they were working with a good script, or anything. This was a paycheque movie for both of them, and they acted like it. Shredder looks absolutely ridiculous. When he finally gets his Shredder armour, which isn’t until nearly the end (since when do we ever see Shredder’s face?) it looks like it was made up of all the spare parts of a Transformers movie. It looked terrible, and during his fight sequences, it was pretty ridiculous. How much stuff are the turtles going to carry around with them? Donatello constantly has a massive amount of crap on his back. 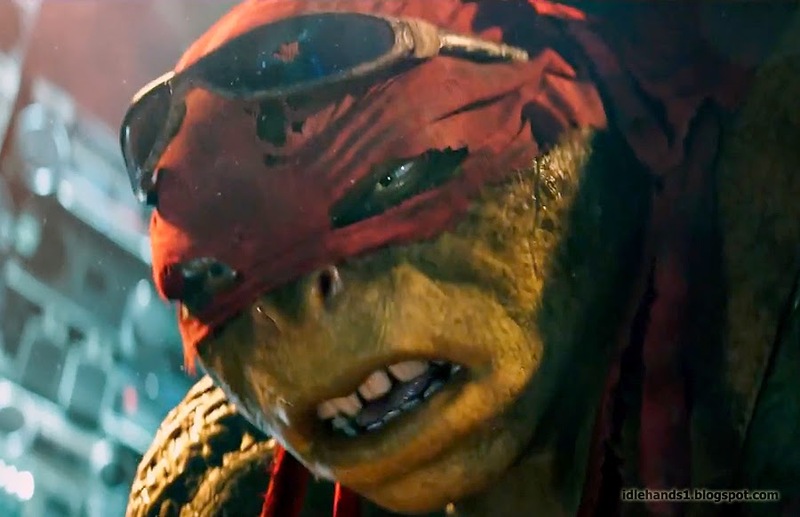 And Raphael annoyingly has a pair of sunglasses on his forehead for the entire movie. Seems pretty impractical for ninja stuff, if you ask me. The fight sequences are definitely from the school of Michael Bay directing. A lot of action that is very hard to decipher what is actually going on. They just end up being messes of noise and colour, and lose any impact of the events that are actually transpiring. The directing of Jonathan Liebesman is pretty poor. It is like he just discovered that you can tilt the camera for shots, and then decided that he should probably just go ahead and do that for every single scene. If you like low angled, tilted shots, then this is the film for you. The story itself somewhat follows the original, but it is managed to be rendered pretty silly (well, even sillier given the source concept of this whole thing). The childhood connections of the turtles with April O’Neil is ridiculous and not needed. How would she not remember these things from her childhood, like saving a bunch of turtles from a fire? Not easily forgotten, one would assume. There really is poor development of the turtles themselves. One part of the original series was that they were so unique from one another. That comes across a bit in the film, and they touch on it, but it isn’t enough to really make a difference. Not that anybody is watching this film for the characterization or anything, but a little bit would have helped. The whole April O’Neil story line of wanting to be a serious reporter is pretty dull. These are some pretty big hits against the quality of Teenage Mutant Ninja Turtles. It is not a good film, and perhaps worst of all, it is not very entertaining to watch. I honestly don’t care if a movie is bad, but at least make it fun. TMNT does neither. However, there are a couple of decent things in this movie. Megan Fox is still pretty damn good looking. And she can really fill in a pair of jeans, so that is a plus, I suppose. There are a couple of funny parts from Michaelangelo. Of course, he is the goofy one, but he actually gets to provide some humour to the film, and some levity from the general stupidity. A funny scene when the turtles are in an elevator and start to make music as they ride up for their final fight. It was weird and out of place, but it was actually pretty fun. I didn’t hate the way the turtles looked, as many people have. The CG is well done (until the clusterf*ck of the fight scenes). Not exactly a stellar list of pros for this movie. I get that some people quite liked Teenage Mutant Ninja Turtles. I feel that were a lot who were happy that it was “just ok,” and not complete childhood blasphemy. And we have a plethora of options of films that are just ok.
TMNT doesn’t even make it to that low standard, making it a film that I would recommend skipping.